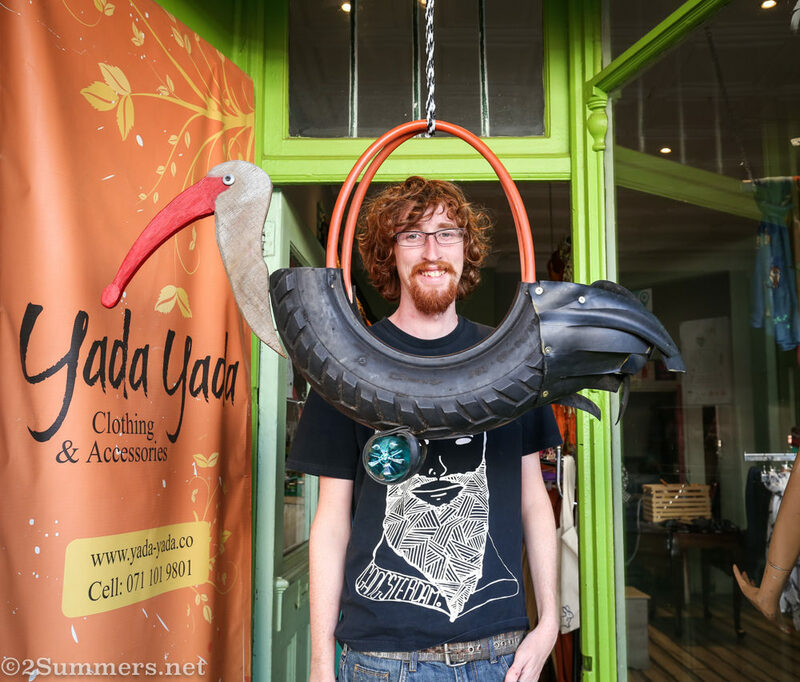 Hadeda tire planter from Yada Yada in Melville. 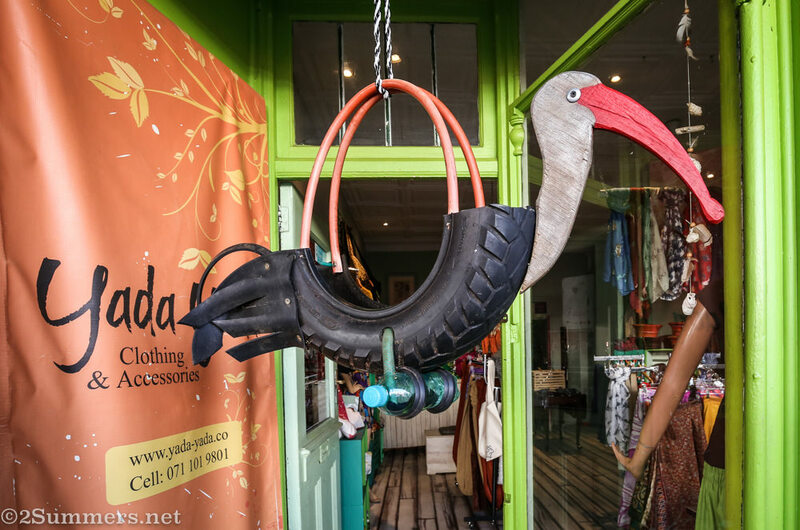 If you don’t live in Joburg and don’t know what a hadeda is, read here. But these hadedas are not easily transportable, so unless you already live in Joburg (or at least in South Africa) then you probably can’t have one. 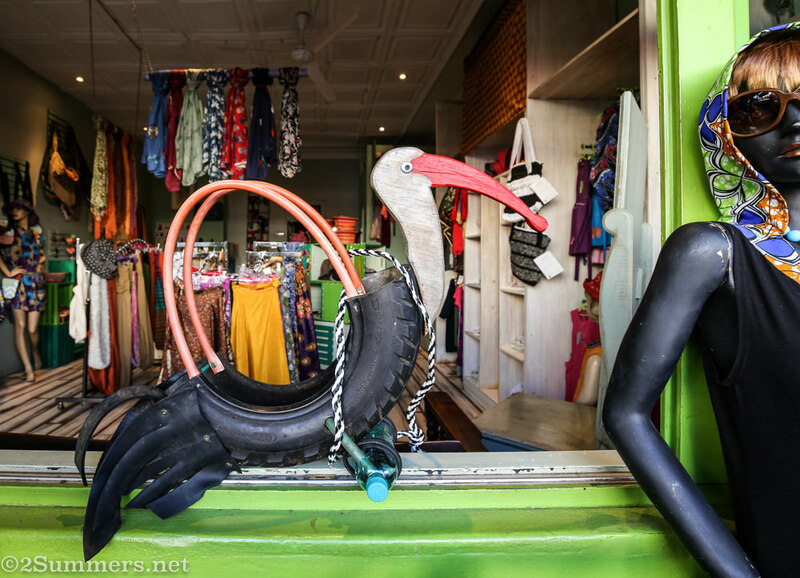 If you do live in Joburg, then make your way to Melville’s 7th Street and buy a hadeda. 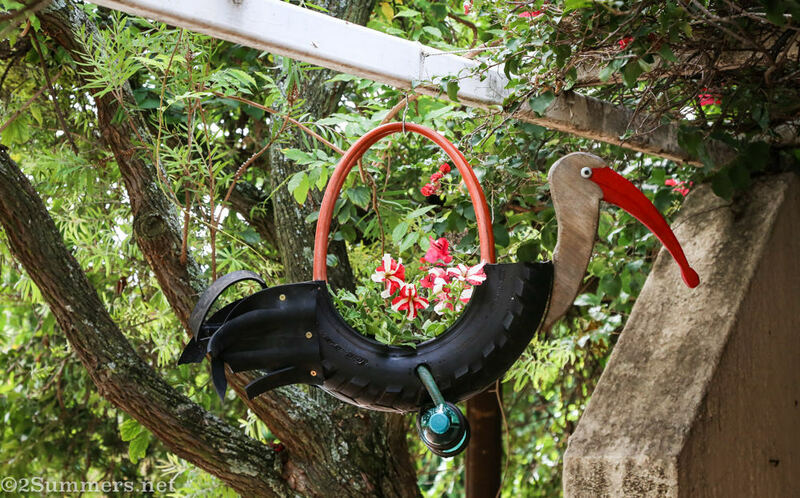 They’re made of recycled materials, they have a built-in irrigation system, and they can double as large hand-bags. Ray photobombs Hadeda. Ray carried Hadeda as a handbag for a while after we bought her. Hadeda in another position at Yada Yada. We did a whole photoshoot with her. If you’re not into hadedas (some people aren’t, although I’ve never understood those people) then you can also buy an owl. Best of all, Hadeda looks fabulous in our garden (as I’m sure she would in every South African garden) and she makes me happy every time I look at her, which is at least 50 times a day. The red petunias match Hadeda’s beak. The Melville Cat likes Hadeda. 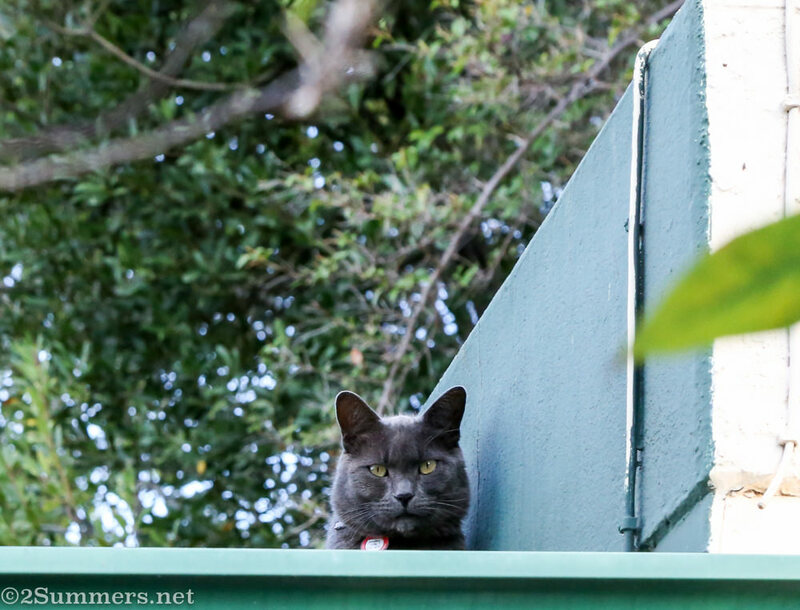 The Melville Cat looks down on us from the roof as we hang Hadeda. I think he likes her — don’t you agree? I love Hadeda. That is all. Yada Yada is on 7th Street in Melville, between 3rd Avenue and 4th Avenue. The man who makes the hadedas likes to take his time so be sure to allow a few weeks for your order to be processed. Ooh, I reckon I could fit one or two of those in a suitcase. I can think of one of two people back home who might like one of these for Christmas. I was actually pondering the idea of buying one and trying to dismantle it to fit into a suitcase. I also have many family members back home who would love one. But I know myself better than that — I’d never be able to reassemble it again after taking it apart. Me too. Now I get to smile 50 times a day! Hade ha! – enjoyed this….! Brilliant pieces of work, love the concept, love the execution! They really are so clever. Want Hadeda now. Love the picture of Ray. I wish I could figure out a way to get one to you. Have always admired them when walking in Melville. They’re impossible not to admire. I feel like they have transformed that entire block. love the excitement, love hadedas, love 2Summers! I want the Melville cat! So very cool! 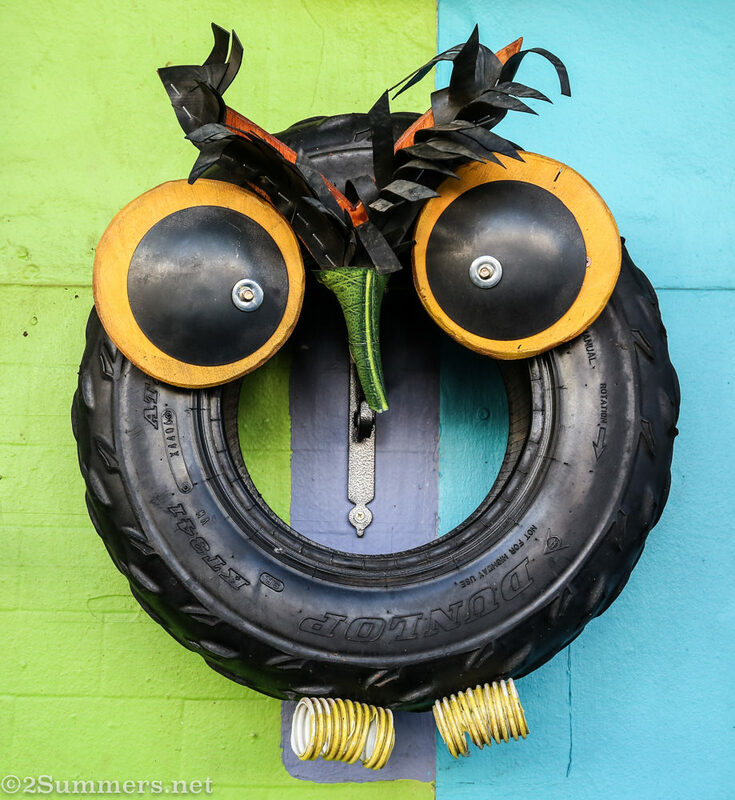 Was thinking of upcycling a few car tyres we procured for my balcony gardening, but read that some of the chemicals in the tyres can leach into the soil if not properly sealed. One day I’ll make time for that project. Is it possible to ship? These are fantastic! I’m sure it would be possible but I think it would be REALLY expensive. I wish I could bring one back for everyone though!